Type A personalities may grab a lot of the spotlight, but there's definitely something to be said about having a Type B person in your corner. Type B folks get a bad reputation for being blasé, but that couldn't be further from the truth. 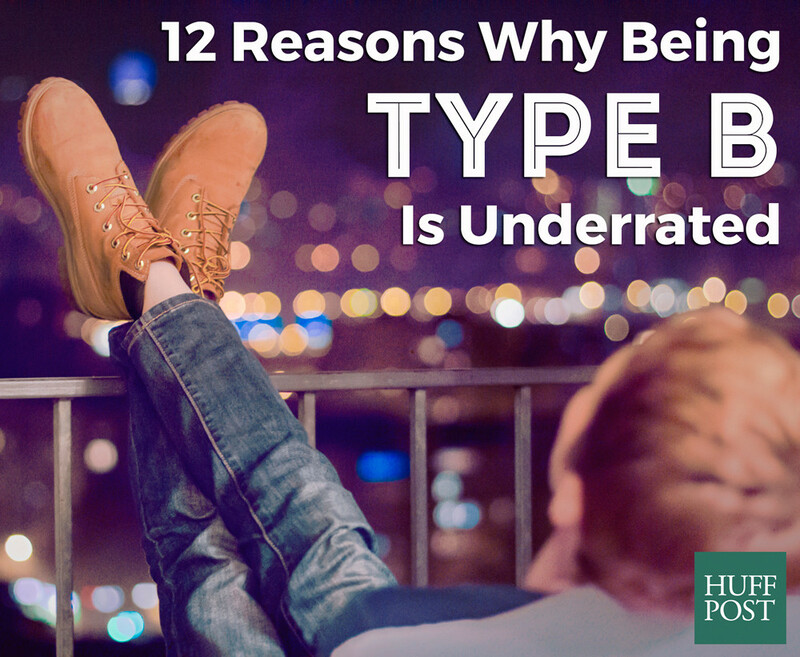 Just as in the case of being Type A, there can be some serious perks to being on the B-side. Some of their hallmark traits include being more patient, collaborative, creative and they tend to be averse to aggressive conflict or stressful behavior. Below are a few things Type B individuals want you to know about their easy-going personalities, including responses from The Huffington Post's Facebook community. 1. They're laid back, not lazy. This calm behavior actually works to Type B individuals' advantage. Their relaxed nature makes it likely that they won't experience a lot of chronic stress, which research shows is remarkably good for heart health, immunity and mental well-being. 2. They work better in a creative environment. Type Bs are not only creative individuals, they're "big picture thinkers," as The Huffington Post reported in 2014. This means they look to the outcomes more so than the minor details -- a trait that can be deeply valued in the workplace. 3. They thrive in group projects. Type Bs are known for being invested in the process rather than engaged in competition with their peers. This behavior bodes well for collaborations; Type Bs are happy to share credit and take pride in the total, big picture outcome. Keep calm and work on. 5. They dislike dwelling on problems. This goes back to the easy-going nature of the Type B personality. Ruminating over problems creates a cycle of stress -- a cycle they have no interest in perpetuating. The ability to see the good in others is a hallmark trait of Type B folks, which makes it likely that they'll connect with all types of people. Not only that, Type Bs tend to be noncompetitive, more patient and have a comforting demeanor -- and that's certainly the type of person you want to have on your side. 7. They have their own system to organization -- and it works. In fact, there are some perks to their state of "organized chaos." Research suggests that individuals with messier desks are more creative. 8. They prefer a calmer pace when it comes to tackling tasks. The quickest way to stress out a Type B person? Force them into a state of hyperactivity. 9. They can be sensitive, too. There's a big distinction between relaxed and indifferent -- and Type Bs are the former, not the latter. 10. Sometimes they're night owls. Snooze on, Type Bs. Sleep is good for you anyway! 11. They're more satisfied with life. Individuals who indicate they have high life satisfaction on their Type A/B personality test tend to identify more on the B-side. Type Bs know that whether it's happiness in the workplace or happiness at home, there's nothing quite like the comfort of feeling content with your circumstances. 12. When it comes down to it, they'd prefer if you don't label them. Simply put, Type B folks are too laid back to get wrapped up in the details. Enough said.